Rating: 5/5 Full 16GB RAM for 13" mid2010 MBP 7.1 March 7, 2019 Just wanted to say this 16GB upgrade for the 2010 13" MacBook Pro works great. To give greater confidence to other 2010 13" MBP users, here are details of what firmware is on my machine: BootRom MBP71.003F.B00, SMC Version is 1.62f7. Goof luck! Rating: 5/5 a good solution for my problem with disk January 21, 2019 A few months ago, I filed an objection to disk quality (120GB OWC Mercury Electra 3G SSD 7MM), which after a short period of installation failed. But after I wrote my remark to OWC and MacSales.com, the company OWC replaced the old disk with a new one in very short time. 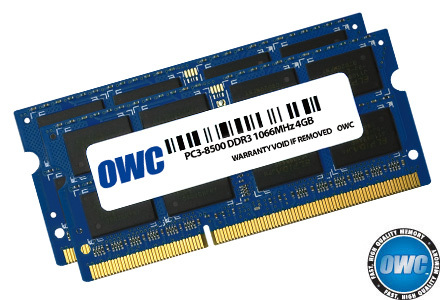 I take this opportunity to thank the OWC for efficient problem solving and a high professional level and to recommend OWC and MacSales.com to all future customers on this official website. Rating: 5/5 Ram always helps December 27, 2018 I was given a free 2009 20-inch iMac, 2.66 Ghz that only had 2 GB ram. Wiped it and installed El Capitan, the last OS it could handle, 10.11.3. Slow as molasses. Painfully slow. Too be expected though. The GPU is old, as is the CPU. Tweaked the prefs to turn off the fancy transparency stuff, but still slow. Just maxing out the ram to 8GB helped immediately. Activity monitor showed before almost all the ram was being used just to run the OS, lol. This upgrade helped a lot. Also replaced the HD with an SSD, which helped this old machine astronomically. But that's in another review. Using this old mac as an email server. Working like a champ. Ram helps. Rating: 5/5 Great upgrade and easy to install! November 13, 2018 Had zero difficulty installing the product. Great upgrade for the price! Definitely Recommended! Rating: 4/5 Installation flawless - outcome ok November 6, 2018 The installation of 16GB of ram in my IMAC was flawless. The instructions were excellent. I discovered a fair amount of dust bunny stuff in the compartment and this needs attention. After I closed up the IMAC and turned it on, it booted flawlessly. Then the major question: was peformance better? The answer is a qualified yes. Some of the delay was not improved and may relate to my Cable Service (Optimum) and some may relate to performance issues with Chrome. So the outcome was positive but maybe not the tremendous increase of speed that I expected. No fault of this wonderful company. Rating: 5/5 Like New October 29, 2018 OWC/MacSales.com was a pleasure to deal with. To make sure I ordered the correct memory upgrade for my IMac, I called and spoke with a tech representative. He checked carefully with me and then re-assured me what to order. The upgrade kit was delivered as ordered. Once installed (which was easy and took only about 10 minutes), the computer worked as quickly as it did when I first purchased it years ago. Very happy with OWC. I already recommended them to a friend and would definitely order from them again. Rating: 5/5 Simple Upgrade · Great Result October 25, 2018 I just upgraded my MacBook (13-inch, Mid 2010) from 8GB RAM to 16GB RAM. OWC makes it so easy to order the right parts by making sure you select the right MacBook model and ID. In my case, this was a MacBook7,1. I ordered with confidence, they shipped the next day! When it arrived, I went directly to the Install Videos they provide for my model MacBook7,1 and the hardest part was unscrewing the 8 itty-bitty screws! I was grateful that I had already had purchased my screwdriver kit from OWC years ago. Rating: 5/5 Great Parts, Fast Shipping October 24, 2018 RAM is always an easy upgrade on any computer and these showed up quickly and in professional packaging. Work wonderfully after days of heavy use. WOuld recommend to anyone trying to liven up an older macbook! Rating: 5/5 Great, works as intended! September 24, 2018 We talked with the representatives about my computer before ordering and I ordered what he had recommended. Easy to install. So far so good. Thanks for the help. Rating: 5/5 Great upgrade!! September 5, 2018 Great upgrade for the price, easy install. Rating: 5/5 Improved the performance of my MacBook Pro September 2, 2018 Running High Sierra on a MacBook Pro (15-inch, Mid 2010), these memory chips greatly helped the stability and performance. Easy to install, power down, flip macbook over, just note which screws are the long ones on the bottom(3 in total), press tabs on each side of old memory chipsets, carefully remove when they pop up, insert new chipset. Power up and it's automatic from there, once it loads the desktop and settles suggest doing at least one restart to ensure changes took place. Rating: 5/5 Great product August 17, 2018 Bought this RAM to boost the performance of my MBP 2010 13". Very satisfied with the product. Had no issues during installation or runtime of the system. Rating: 5/5 Great! August 13, 2018 Got my 8-year-old MacBook working really fast, great product & service! Had quick query to ask on online chat and was replied to instantly, with great help. Thanks OWC! Rating: 5/5 Memory Upgrade, Mac Mini 4.1 (16 GB) August 7, 2018 Received shipment quickly and the item was well packaged. I installed 2, 8 GB ram modules in all of about five minutes with zero difficulty. Turned the Mac Mini on and it recognized the new RAM almost instantaneously. There's a definite improvement over having just 2 x 2 GB in this Mac Mini (mid 2010). Thank you OWC, very satisfied with this purchase! Rating: 5/5 Don't hesitate to upgrade your ram August 7, 2018 Great service and very helpful--called to confirm I was ordering the right ram and got great advise. The video instruction they provide is excellent-I am a home owner user with very little talent but upgrading the ram in my Mac desktop, late 2009 27 inch, was a 5 minute job. The core must accept the ram and in my case did--I7 core model 11,1 Even though the title of the product may not incorporate your particular model, as in my case the ram fits and a phone call was all that I needed to complete the order. Great guarantee so just do it! Increasing the ram really helps, especially considering that operating system upgrades can slow your computer over time. Rating: 5/5 MacBook Life Extended August 7, 2018 My daughter's MacBook was running painfully slow with the latest OS and updated apps. The solution was to double the physical memory from 4MB to 8MB. This affordable upgrade has returned the MacBook to being responsive and extended the useful life of the MacBook. Rating: 5/5 Just what I needed July 29, 2018 Went from 4gb to 16gb. Easy install and really speeded use my older iMac. Rating: 4/5 Working good for mac mini 2.26 late 2009 July 28, 2018 No problem.